Create Video Course Websites: USCREEN is most recommended! →Create Video Course Websites: USCREEN is most recommended! Limited Storage, bandwidth, Payment processing, systematic delivery, user management, copyright protection, exorbitant costs, etc, are some of the major menaces of today’s video content marketing. Nevertheless, in this post, we are looking at Uscreen, the fun-filled, user-friendly, practical and feature-packed video distribution platform that allows content creators to distribute videos and course content to anyone globally, either as a subscription, one time purchase or rentals. Uscreen provides video publishers (individuals and institutions) with the required tools and features to create branded video subscription websites. What this simply means is you can have your own membership site where you produce and market your video content directly to your customers in a very simple-to-use way. How can Uscreen help create video course websites? Are you a fitness instructor, motivational speaker, software engineer, etc? Uscreen allows you to create your own membership website where your students will be able to access your content based on different levels of subscriptions. Often, it is very difficult (if not impossible) to bring your employees under one roof and offer the required service training. What about a platform that allows you to easily upload training videos and track learning progress for each an every employee. Everyone can access the training videos anywhere, anytime, 24/7. Looking for the most practical way to securely broadcasts your webinars and live events? Uscreen allows you to schedule live broadcasts and monetize your Webinars through your paywall. With Uscreen, you can practically expand your church beyond your four walls, allowing members and faithfuls worldwide to participate in worship services while at their different locations. 14 reasons to create video course websites with Uscreen! 1 . No bandwidth limit! Uscreen has completely eliminated bandwidth limitation, which is one of the biggest drawbacks in the video marketing industries. Video streaming means huge consumption of bandwidth but that’s not an issue to worry about with this service. Adding chapters to your content is an undeniable way to make it well organised. This of course aids studies and understanding and makes your platform more exciting. 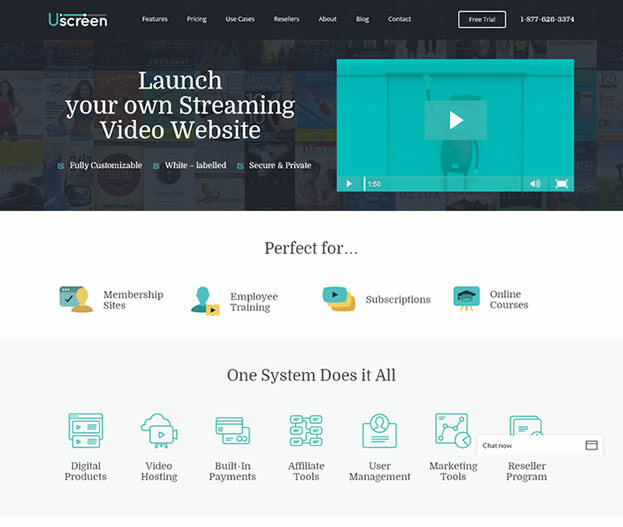 Uscreen is a video hosting and streaming platform. However, this doesn’t limit you to videos. You have the facilities to upload videos, audio, podcasts, PDFs, Excel sheets, documents and any other type of content, and securely deliver them to your end users. If you are an active online business person like me, you know the importance of taking advantage of special events to boost your business. However, some platforms make it really difficult by not giving you the necessarily tools. Generate unlimited coupon codes for the same promotional discount. Create a coupon that only applies to a certain product or set of products to offer targeted discounts. Set activation and expiry dates on coupons. Restrict a coupon to only be usable once or as many times as you’d like. Create coupons to apply a fixed amount or percentage. One way to double profit online is to recruit affiliates who do the promotion and drive targeted traffic to your product page. The folks at Uscreen understood this and made it possible for you to easily integrate most major affiliate providers with Uscreen. Uscreen allows you to create various types of advertising with your videos. This includs pre-roll ads and post-roll ads. It doesn’t matter whether you are in USA, Europe or Asia. Uscreen supports Euros, USD, and many more currencies. This is a common feature with subscription or training membership sites. You can schedule content to automatically appear in user’s library and also be removed automatically. For example, in a 30 day training program, a member who signs up today may not instantly have access to all the training videos. Uscreen can be setup to deliver each video a day so that your students will be taken through a step-by-step training program till the end. You don’t want your clients to know you are using Uscreen. That’s not an issue at all. The platform allows you to customize every single area of your website, including the video player. You are able to remove all references to Uscreen so your clients know the training platform is completely yours. Do you want to have different subscription options for your single store? Uscreen allows you to set different packages for different prices and content. One subscription can have 20 videos while another 50. It’s up to you. If you are not to create a membership website, you can simple allow your customer to pay once and access your video content. Do you want your users to receive a certification if they pass your course? do you want them to receive any form of document if they do not? Uscreen is surely the tool you need to manage this aspect of your program. Today’s content world is mobile and any platform that’s not responsive is certainly keeping a greater portion of its market out. On Uscreen, both you, the publisher and the users can access the courses on mobile devices. Your content can be view online or downloaded for offline viewing on moble. With fully redundant infrastructure, your video distribution website will be available 24/7 while downtime is completely eliminated. Uscreen Makes it Simple – What it looks like inside! Creating your video distribution website doesn’t have to be a job for engineers and experts. Having walked through Uscreen platform, I can confidently tell you it’s a breeze. You need of course to have your videos ready. Every associated file (pdf, doc, etc) will have to be ready too. You’ll need to have the complete course well described and every individual video titled and described as well. Once these (and other necessary materials) are ready, it’s time to head over to Uscreen, where you’ll be required to fill simple html forms (copy & paste) to get your store setup in minutes. While on your Uscreen account, one of the things to do is take care of some basic settings. Clicking on Platform Settings will take you to a page where you need to get those basics set up. See image below. On this page, it’s quite straight to the point. You may however need your domain registrar to get your domain name perfectly pointed to your video store. There are more other things you may want to look around and get ready. These are thing like customizing your design, creating static pages, setting your payment options, etc. However, I’m excited to quickly show you how it’s super-easy to create your online courses – onetime payment or subscription type content. Create a program for one time Purchase! On the platform, a program is a combination of training materials. These are videos, pdf files, text files, etc. So let’s see the simple steps to create a course with more videos. In the program creation process, you’ll have to use the content uploader. It allows you to upload any files you have for your course. These include video files, pdf, docx, etc. What you do here is upload all the files you have (probably well arranged in a folder on your local drive). You don’t need to worry where which video should go at this point. -> Adding a chapters to a group! One of the reasons I recommend you create video course websites with Uscreen is the ease to manage program chapters. Once you click ‘Add new chapter’ under any group, you’ll have a pop up window. The Mark as free chapter, if ticked, visitors will be be able to access this video for free. If this field is allowed unticked, the chapter will only be available to paid users. The Choose Video field only shows a list of videos. Other content types (docx,pdf,txt) will not show up. Now, here below is what my demo store looks like. This is the course page where customers can read more about the training program, access free chapters and buy the course. You notice from the image below (default theme) that those chapters that are not marked as free (above image) are disabled. Those I ticked Mark free chapter can be accessed by anyone on the site. Check out this video for more on how to create your video training programs. What about setting up subscription courses? That means your clients will have to subscribe and be billed weekly, monthly, yearly or billed just once and get unlimited access. That’s absolutely up to you. Uscreen is very flexible and I think it’s what you need to create video course websites. What you do is create your courses/programs first, then go to Subscriptions -> Add New Subscription! You need to have one or more courses ready. You can select as many courses as possible per subscription. Customers can choose different terms of subscription and pay differently. Checking the ‘Make Public‘ field means you are ready to go live. You agree with me that creating a video distribution website is no longer a barrier to your business. Whether you are an individual, an institution, a church ministry, etc. Uscreen has combined all the tools you need in one place. Sign Up for a 14 Day Free Trial. No Contracts, no Credit Card required. Leave your comment below and let me know about this platform. Have you ever known it’s this easy to create video course websites? This is great review of USCREEN and it looks very good tool for creating video course website. You discussed each and every thing to get started on this amazing platform, I really enjoyed. Really even I gone through UnScreen and found that it is an amazing tool for creating videos courses website. Also the best things which attracted me was recurring commission in their affiliate program I am going to join there network soon. Enstine Muki recently posted…CommentLuv Black Friday Discount 2015 – Up To 50% OFF! Glad to meet you once again! Yes, Video is playing effects on websites. In recent times, Most of user’s don’t read all content, but easily learn by video. One of the best explanation of USCREEN, and the nice combination of features and specification as well. Thanks for tips and shared this information to colleagues. There are lots of these platforms out there but I think Uscreen is standing out in terms of what it offers its clients. This is really an amazing tool. Thanks for sharing this well explained review. I am bookmarking it for my use. Thanks Philip for the comment. nice explanation and this is what i am searching for. Thanks for your feedback bro. I have thought about creating video site as my next project. I have been searching for something like this. Well what a timing!. Well explained review about UScreen. I would definitely buy from you when I start the project. You’ve got what you were looking for, bro. This is a perfect tool for video distribution. Unscreen looking like a problem solver for online courses, I am planning to start my own video courses to sell online, I will try this software tool to start my video online courses, have you used it personally? is there any negative points to consider in this service. Thanks for sharing this information, I think it will become successful if they provide good customer support to their users. Yes I have personal experience with it and I have not found anything negative. I have my own suggestions just for a better experience but the whole thing is an awesome bundle. I just want to say this post is very detailed on about creating Video Course Website that can help me a lot! Really, you described very well every points in this article and very easy to understand. Most thanks for letting us know about USCREEN features. Anyway, very well written post and hope this post will help us more on creating video course websites. Thanks for the feedback man. Very Well done Enstine, infact you have shared a detailed and step by step guide about UScreen. This is very advantageous tool for those who are planing to launching a video course. I’ve created about six small courses, plus one mega course. The large course was fully coded by my coder and is hosted on WordPress. For the smaller courses I use Derek Halpern’s Zippy Courses. It’s user-friendly and easy to use. But after looking at UScreen it appears to offer a lot more functionality. The downside is that it’s more expensive. That said, if I create more courses in the future UScreen looks like a natural extension of what I’ve done previously. Looks good to me! Thanks for sharing your experience on this. It is very great tool creating video course website. Thanks Pro. I’ve never heard of UScreen but it sounds like a great tool for all of those who are interested in going the membership route. Video is definitely more effective now than it was some 5 or 10 years ago and using a product like this will have you a couple of notches ahead of the rest for the average solopreneur. Thanks for sharing Enstine! Have a great weekend! Yes, videos today have more attractions than before. Stats from Youtube and other video sites are a clear proof that going the video way is the winner. very interesting for people who want to do video course sites . I think it is something which will get more popular. curses. I am going to have a closer look at it . courses. I am going to have a closer look at it . Thanks for being part of this post today ! It will be quite exciting to share this with your coach friends. This platform is perfect for them. I guess this is something unique and challenging strategy and I was thinking about it since while after I subscribed to some of courses at udemy. You’ve covered lot of things in a single post which is very helpful. Are you giving this a try too? Yeah I am giving a try on this strategy. I will update you hows that going with it with comment over here. I hope that is fine. I can’t stop myself without saying What an awesome detailed review! I think you didn’t miss any single feature of Uscreen. And the best thing is you shared complete step by step guide also to create video course website. Thanks to share such useful article with all of us. I came across first time in this websites and to see awesome article. In global content market, Content is part of blogger, but a creative blogger always changes ideas on that website. One of the basic need in recent time to create visitors who is influence our website, so make some beautiful images with videos. In video websites, where different kinds of features are available, is USCREEN, truly. Nice article or excellent worked. Great list of Video Creating Software, Video website is very benificial for making awesome money. this is really great review of Uscrean video software. Thanks for sharing with us such amazing post with us. Great tool and a great review. I think its a really good tool to create video course. I have never seen a review like this where the features are amazing. Uscreen looks like an awesome platform that will make a digital marketers, bloggers and content creators smile. Thanks for sharing. Have a swell week. I don’t know USCREEN and after getting bunches of information from this article. In our blogging one of major role play of video, so it’s benefits for us if we buy it. Different kinds of features and specification are available on this website tools, thanks for shared. Hello Again Enstine, Just finished learning more about Uscreen, Wow you did a great job with this review. It is true more and more people are watching video’s then ever before, so I do see this as an awesome tool to have. Perhaps 2016 is my year to do more video marketing..
Hi, Enstine thanks for the Useful article. I love your article. Reading all your post. Great work. This is wonderful review of USCREEN as well as it looks very good tool for making video course blog or website. You have explained every thing to get started on this amazing platform, I really enjoyed. You really rocked it. I just loved it.. There are lots of YouTube hacks are now available to save our time like now we can remove recommended videos from YouTube homepage.